As we finished loading our vehicles, and headed south through KY, TN and AL for the first of what would be many volunteer trips to the Gulf Coast, we each secretly contemplated the historic and possibly heroic nature of this disaster relief mission. Our natural, human egotism prompted each of us to aspire to great and courageous humanitarian deeds. In the earliest days of our Katrina relief trips I feared I was the only one entertaining such prideful and self-important thoughts. But in candid, reflective conversation with my fellow volunteers in the weeks and months to come, we all admitted to each other that part of our initial motivation to participate was the self-satisfying expectancy of doing great deeds. In other words – we perceived the value or “meaningfulness” of our volunteer work, at least in some part, in terms of our own sense of achievement and recognition. 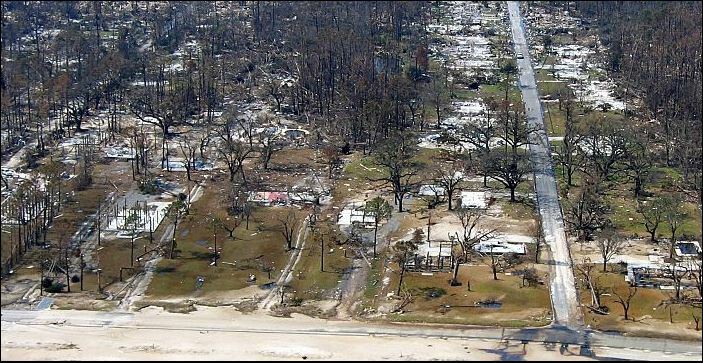 On the final leg of the trip, down I-10 toward Bay St. Louis, MS, the full magnitude of Katrina’s fury was slowly unveiled as we neared the coast. But it didn’t really grab us by the throat, until we drove along the beachfront roads and bayou canals near sea level. We stared open-mouthed at street after street of bare concrete slabs, empty twisted stilts and wreckage as far as you could see. Even the trees were stripped of leaves and smaller branches. The enormity of the destruction slowly saturates your consciousness, and the dreadful vastness of 68,000 homes destroyed in just six hours consumes your reality – pushing all thoughts of home and comfort far into the background. Again you ask yourself, “With so many in so much need, how can just one volunteer make a meaningful impact?” With over a hundred miles of coastline ghoulishly disfigured; with homes and trees shredded and strewn about like plastic toys, you feel awestruck by the desperate circumstances facing hundreds of thousands of the coastal residents. You imagine yourself one measly drop, in an immense ocean of need. a Drop in a Thimble? As we receive our first work assignment from local volunteer coordinators, and interact with other groups of volunteers, we begin to see how the incremental, seemingly insignificant actions of individual volunteers are aggregated and directed into focused pockets of effort. It becomes clearer to us how the efforts of small teams, focused on a larger vision, can make significant contributions to a much larger goal. Small groups from Ohio and Indiana; large groups from Wisconsin; and even larger groups from Michigan and Illinois are gathering all around us and carving up the “insurmountable” into smaller chunks of “possible”. As hands and materials become available, the “ocean of need” is gradually divided into lakes and ponds; tubs and buckets; cups and thimbles. Eventually, each “cup” of need is defined for an individual family, and our volunteer crew sets off to do its part to fill that cup with all the time, materials and compassion we can muster. A thimble might be a new roof, a freshly dry-walled bedroom, a coat of paint in the kitchen, or a wired and cabled frame, but it could just as easily be the humble drudgery of shoveling mud from the slab or collecting debris from a field and filling a dumpster. Yes, it is extremely gratifying to actually finish a home for a family and see the joy and relief in their faces. But you come to understand that every task completed for their benefit brings them equal joy and equal satisfaction, because every completed task brings them hope and moves them closer to recovery and stability. It crystallizes in your mind that there are truly no insignificant jobs – every task, however dirty, repetitive or menial, is still meaningful in the eyes of that family in front of you. Their love and deep appreciation are no less for the mucking of mud than the final shingles on a finished roof. Were it not for thousands upon thousands of full thimbles, there would never be full cups; and if not for full cups there would be no full buckets. Buckets become tubs, and tubs become ponds, then lakes. And yes, eventually, the thimbles fill the ocean of need. Whether you are a front-line supervisor, manager or C level executive, stop and think about how you measure the value of the contributions of individuals comprising your organization. Even more revealing, how do you perceive the value of the contributors, themselves? In each organization there exists an “ocean of need”, in terms of all the work that needs to be accomplished each day. Some of that work is regarded as very important and high profile; much of it is dirty and repetitive, yet all work is necessary for filling the many thousands of cups and thimbles and the successful completion of each day’s business. How do you, as the receiver, define the meaningfulness of the work you accept from your team? Like the grateful families on the Gulf, do you treat all work with high regard and equal appreciation or do you take some of it for granted and devote your attention only to the work designated as “important”? How do you think your reaction to their efforts affects the quality of work-life and level of engagement, for the rest of your team? Whether you are a design engineer, mechanic, HR administrator, manager, or machine operator, stop and think about the degree to which you devote your efforts to the success of the larger team. How do you regard your work in relationship to your co-workers and internal customers? Is it all about you? Or can you honestly say you contribute your best in order to achieve the larger goals and objectives for the success of the organization? Do you fuss over the seeming insignificance of your “thimble” or are you able to devote your energy to something larger than yourself? Do you make the effort to engage your better self and accomplish ‘small things with great care’, to paraphrase Mother Teresa. We arrived at the Mississippi Gulf Coast feeling like mere drops, overwhelmed by the immensity of the ocean of need before us. We wondered aloud how our modest contribution of work could possibly be meaningful in relation to the scope of the overall objective. Our pride spurred us to aspire to great and courageous deeds, but the faith, hope and gratitude of the residents taught us the value of filling just one humble thimble at a time…in service to the accomplishment of something incalculably larger than ourselves. Let not one of us ever forget that lesson.